Update: Mr_Ghostface_Lives has just replied to our private message from two weeks ago. This is appended at the end. For whatever reasons, I made up the rumours I posted recently. I’m not employed by any entity related to Star Wars, I have no access to any tangible material to back up my theories and everything I’ve posted about the new films was pure guesswork. I’ve never been fortunate enough to be near a Star Wars movie set, but I’m pretty intuitive when it comes to story and production and this isn’t the first time I’ve ruffled a few feathers by guessing correctly. It’s not worth the hassle, so I’m going to just quit the prediction game and wait for the movie. Mr_Ghostface_Lives made a name for himself during the run-up to The Force Awakens. He was able to get a number of locations right, such as “desert planet”, a “Hoth-type environment” and other assertions that sounded credible. However, he also had some crucial misses, like his assertion that Finn is Lando’s son. His leak history is chronicled here. I said Finn was Lando’s son? I certainly don’t recall that, as I never heard that as anything but a rumour. Indeed I was not lying about the sets at Pinewood, and I’m not lying about Leia using the Force and then pretty much disappearing from the story. I could say how she uses it etc but I don’t want to give such specific spoilers. I’d much rather fuel people’s anticipation. When confronted with his exact posts, however, he weakly claimed he was “drunk on wine” and was just having mischievous fun. I just realised that there may be some misinterpretation of the material I read – remember I read it out of context and in pieces. The Leia using the Force stuff is 100% on the money, and I’m confident that will make the final cut, but the parentage of Rey… I just realised that it’s possible she may yet be Luke’s daughter, but he isn’t aware of it. There is no family “reunion” in the first half of the script and he doesn’t know her, but I just realised the possibility that he either didn’t know he’d fathered anyone, or didn’t know she’d survived some past incident. So, maybe there is a revelation later that I haven’t seen. Currently, his posts regarding Episode VIII have already been deleted. I appreciate your message but I can’t discuss this any further, I’ve been warned and I realise it was stupid to have posted anything. Regardless of the truth or otherwise of anything I may have said, I must retract everything I’ve posted. I have no access to any material regarding the new films, it was pure guesswork. A couple of days ago, we brought you the sensational Jedi History 1.1 lesson from KY10REY, who purports to be a production insider for Star Wars: Episode VIII. Today, Stormtrooper Larry sat down with KY10REY to find out more about the film. Whether his claims are true or not, we leave up to you. We’ve reserved the juiciest stuff at the end. He first appeared in February 2016, when principal photography for Episode VIII started. KY10REY claims to be part of the production crew at Pinewood Studios with insider knowledge of the film’s progress. Why should we listen to him? KY10REY seems to have advance knowledge of what Space Bear Industries, the front name for Episode VIII, is up to. Then in early May, he announced that Adam Driver was going to join Mark Hamill and Daisy Ridley in Ireland for the Ahch-To shoot, and even broke down their scenes by location. With that out of the way, let’s get to the juicy stuff. Here’s the exclusive intel from KY10REY. That’s because it is — it came from a storyboard. KY10REY says “phones, cameras and tablets are not allowed… but pen and paper are”. He was actually writing down what he saw from memory as best as he could. “If you look at the tree from a vertical aspect, it’s actually not complete.” That’s because he claims that “most static items are just reference holders for ILM”. Presumably, the tree will be enhanced, or even have its appearance changed outright through VFX. Right after wrapping up in Ireland, part of the crew were sent to Germany and Italy to scout locations for the next movie, the Han Solo anthology film. Note: In the past hour, several readers have asked why the Rogue One trailer is debuting too close to the movie, rather than during Star Wars Celebration. The key word is main trailer. TFA also had several trailers, but the most complete one (the international version) dropped on December 9, 2015, a mere one week before the movie itself. Our guess is, shorter domestic trailers are used to generate hype in North America, where Star Wars is already familiar. However, for other regions where the franchise isn’t a cultural phenomenon (like China), Disney has a longer version. The newer, longer cut also helps sustain the momentum in the US, since it features extra footage not seen by American viewers. Anyway, we’ll just ask KY10REY about it when he’s able to sneak out once more. Finally, KY10REY says he gets asked a lot about Luke and Rey, but not newcomer Kelly Marie Tran, known on set as “Pocket Rocket”. Why should we pay more attention to her? We have more intel from our secret rendezvous, but Stormtrooper Larry has to get back to work (damn Powerpoint slides won’t do themselves). We’ll reserve those for another post if our alleged Bothan insider gives the green light. KY10REY will release the next installment, Jedi History 2.1, before the end of June. So stay tuned! UPDATE: For readers in the UK, the Metro newspaper will be publishing their own interview in tomorrow’s issue. Scoop a copy and see if they have different intel. In the meantime, check out our own story how Ben Solo fell to the dark side! Update (June 20, 2016): Mr_Ghostface_Lives has suddenly backtracked from his assertions and deleted his posts. See the latest news here. About a week ago, noted IMDB user Mr_Ghostface_Lives came out with the sensational statement that Luke isn’t Rey’s father, and Leia will be using the Force in Star Wars Episode VIII before “being written out”. I just realised that there may be some misinterpretation of the material I read – remember I read it out of context and in pieces. The Leia using the Force stuff is 100% on the money, and I’m confident that will make the final cut, but the parentage of Rey… I just realised that it’s possible she may yet be Luke’s daughter, but he isn’t aware of it. There is no family “reunion” in the first half of the script and he doesn’t know her, but I just realised the possibility that he either didn’t know he’d fathered anyone, or didn’t know she’d survived some past incident. So, maybe there is a revelation later that I haven’t seen. The “Finn is Lando’s son” are claims he made back in 2014 before The Force Awakens. You can see the full history of Mr_Ghostface_Lives’ claims here. Isn’t that the manoeuvre the Falcon made when setting record time for the Kessel Run? And Rey won’t turn bad. 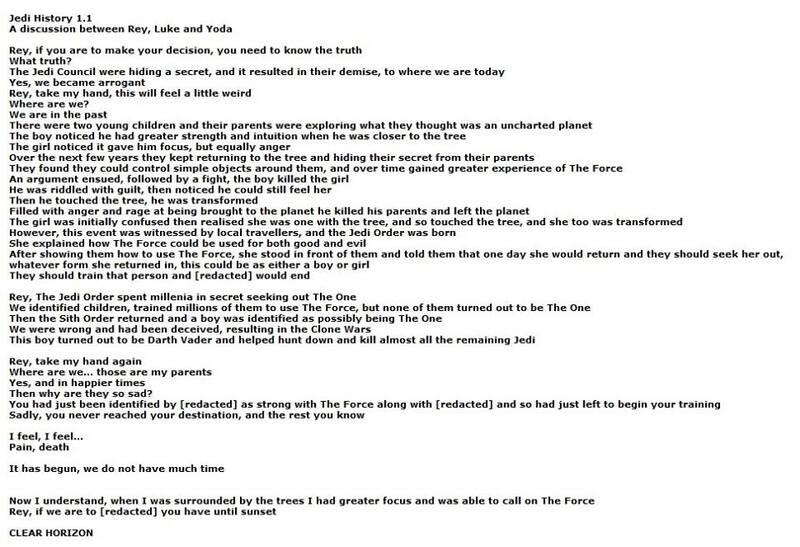 Make sure to check out another alleged leaker: Ky10Rey and his Jedi History lesson! When it comes to Star Wars Episode VIII, one of the more active followers is Ky10Rey. These set outlines were posted by Ky10Rey on March 3, two months before the Ireland shooting. “Space Bear” is the working title for Episode VIII. 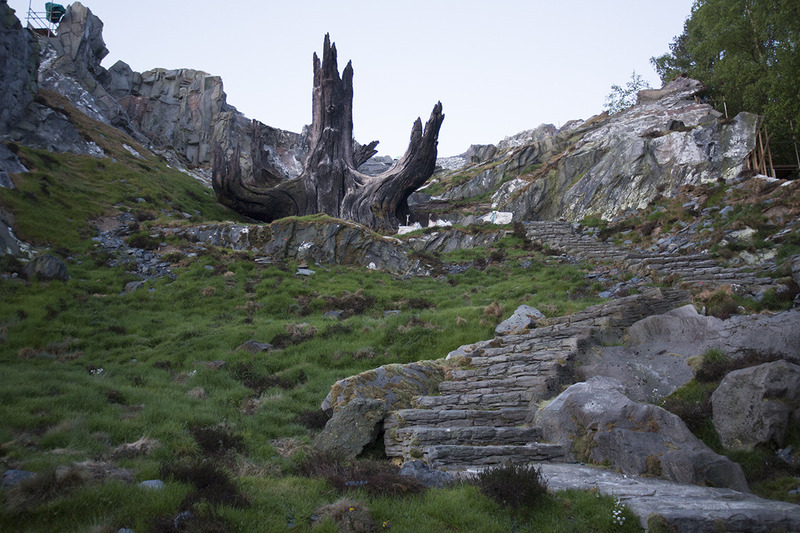 The tree is most likely the mystical, out-of-place looking tree in the Ahch-To set built in Longcross Studios, UK. The line “I feel pain… death. It has begun” might be the scene where Luke and Rey feel the peril being faced by Finn and Leia according to an earlier leak. Then again, it might also be the First Order attacking the Resistance base on D’qar, or the alleged invasion of the temporary Republic capital. The final line “Rey if we are to _____ you have until sunset” hints at a pivotal choice by Rey. And since the deadline appears to be “by sunset”, this scene might take place just before the Knights of Ren begin their assault, which was reported to take place at dusk. 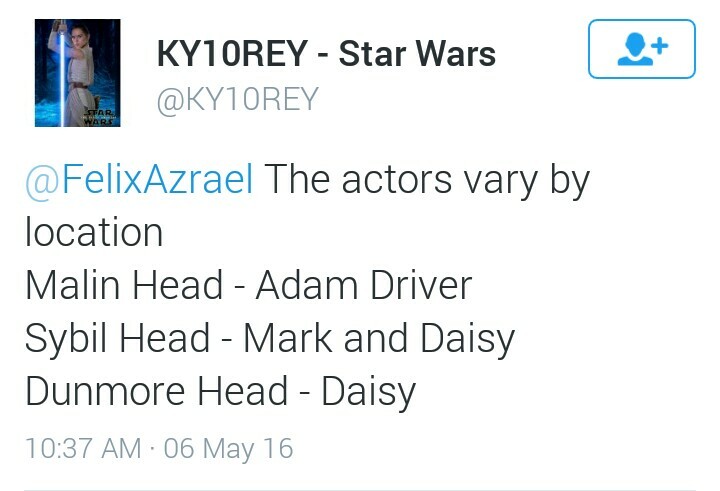 If this is true, it confirms the IMDB claim that Rey isn’t Luke’s daughter. We see her parents in this vision, along with a mysterious companion! Stormtrooper Larry makes no guarantees on the authenticity of Ky10Rey’s Jedi history lesson. As always, take your intel with a grain of salt (and a healthy dose of Corellian ale). If you’re hungry for more Star Wars, check out the Rogue One leak hilariously rewritten by a spambot! 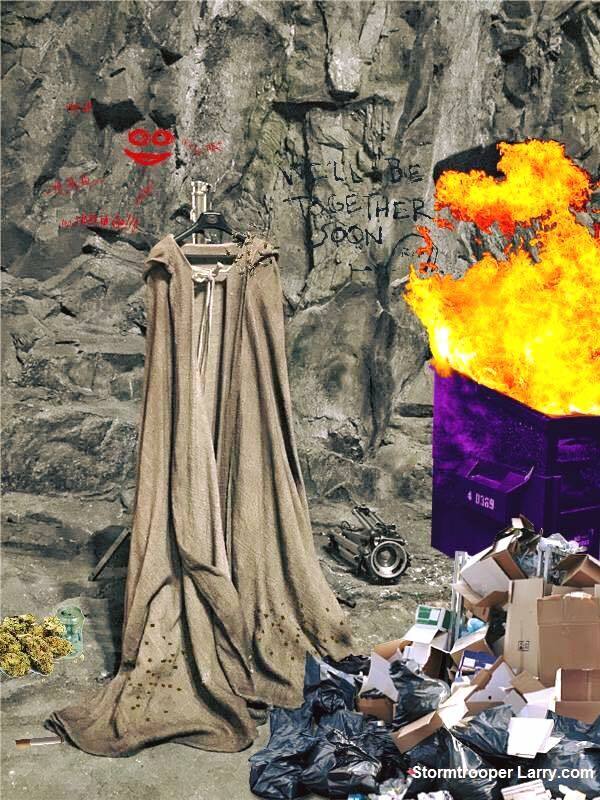 Update: Two hours ago Pablo Hidalgo tweeted a sly remark addressing the painting. See new info below. This morning, eagle-eyed Redditor “ConOrr” posted an interesting find on the Star Wars Leaks subreddit: “Rey’s Lineage confirmed by credible Lucasfilm artist“. The painting is the work of Rodel Gonzalez, a Filipino artist licensed by the Lucasfilm group to produce authorized art. His work has been featured in San Diego Comic-Con and other major events. 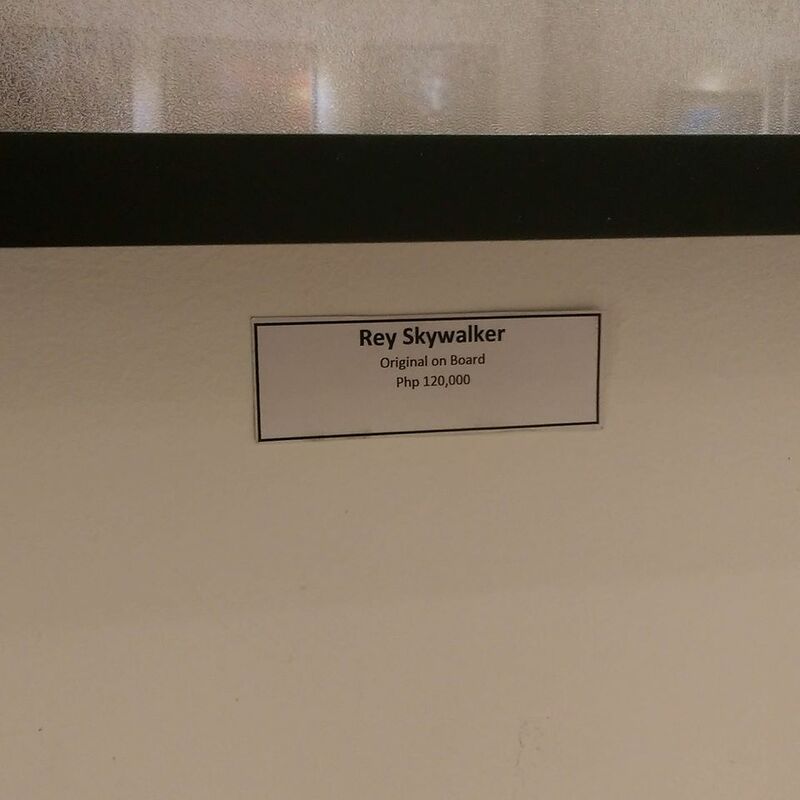 The painting itself, a 14″ x 11″ canvas entitled “Rey Skywalker” has a list price of USD $2,600. It’s currently on display at the Solaire Resort & Casino in Manila, the Philippines, alongside Gonzalez’s exhibit of other Star Wars and Disney artworks. So that puts an end to the dreams of the Reywalker theory being outed by licensing. 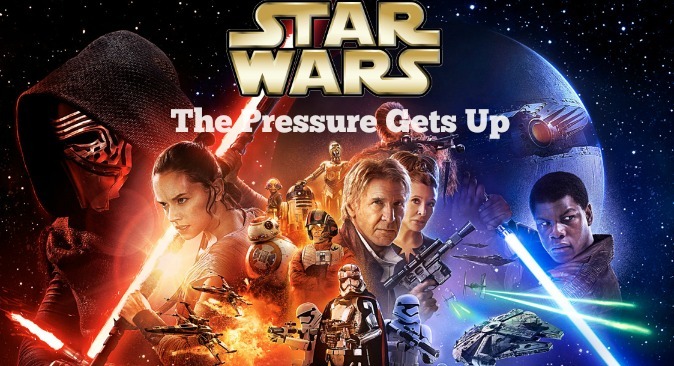 Although it should be noted that many Star Wars plot leaks do come from merchandising, just not this time. The Hawaii-based Gonzalez has been producing licensed interpretative art for Disney since 2008. When Disney acquired Lucasfilm, he was invited to be part of ACME Archives Ltd, the exclusive publishing arm for Star Wars art. He signed aboard in 2015 and has focused on Star Wars since. According to Pablo Hidalgo, only a few people in the Lucasfilm Story Group are aware of the full story arc. And more interestingly, in a since-deleted Twitter conversation this week, he relayed how the storyline of the new trilogy is planned “years in advance”, unlike the contradictory twists of the old EU. (We wanna find the tweet, but it’s Saturday and the couch is too comfy). So it’s highly unlikely that LFL licensees would be privy to Rey’s lineage. In an interview last month, not even the Oscar-nominated editor behind The Force Awakens knew who Rey’s parents are. The deepest plot secrets are known only to third party online vendors, Hot Wheels toy makers, and work-for-hire freelance artists. "Should we tell the actor the character background?" "Hmm. hold off for now. But make sure the guy doing the ACME print gets the full bio." As mentioned, the ACME he is referring to is ACME Archives, the exclusive publisher of Star Wars art. We accept all major credit cards, sixty portions, or a Hasbro stormtrooper (preferably non-licked). Shoutout to Reddit user ConOrr as the OP, and Bothan informants WorldDevastator and Dexter Morgan for the tip! For more Stormtrooper Larry masterpieces, check out our original Rogue One footage before Disney came in and ruined it! A couple of days ago, Star Wars fans were on fire after the return of an IMDB user called “Mr_Ghostface_Lives”, who was an influential poster in the run up to The Force Awakens. Leia gets written out early on, and only survives after using the Force. (In response to a comment on Leia’s Force use) Yes I agree, TFA implies that she never looked into the Force at all, which I found disappointing and very unlikely from a story point of view. Given that she and Luke, to the best of our knowledge, were the last Force users at the end of Jedi, how likely is it that she’d never explore it with Luke? So yes, she uses the Force in Episode VIII, which I think is a phenomenally good move. It’s just too bad that they’re minimising her part again. She’s absent for most of the movie after the opening sequence. Yes, as far as I know she is in Episode IX. She doesn’t die in the script for Episode VIII as it stands. But it’s still disappointing that they’re minimising her screen time. Despite her personal problems, Carrie Fisher is still a very good actress. Well, I don’t know whose child she really is, just that she isn’t Luke’s daughter and it certainly wasn’t Luke or Leia who abandoned her on Jakku. 1. You know who actually left her on Jakku? Some other reason that excludes the possibility of Luke or Leia being the ones who left her? 2. Also, does what you’re seeing line up with the MSW leaks? Have you got any sense of where the big scene of Kylo and the Knights of Ren arriving on Ahch-To takes place (i.e. first/second/third act)? Don’t worry if you can’t answer, but I thought I’d try my luck. I don’t actually know who left her because I haven’t read anything that reveals it, but I have read enough to know who it isn’t, if that makes sense. And it’s neither Luke nor Leia. Regarding all the leaks, there was a great deal revealed there, and some of it I can neither confirm nor deny, but yes, there is certainly truth to some of it. The last we saw of General Leia Organa in TFA, she was in the Resistance Base on D’Qar. If Mr_Ghostface_Lives is a credible source, then there will probably be some sort of reprisal attack on D’Qar. This isn’t a stretch, given that the First Order now knows the location of the Resistance base, and they’ll be hungry for blood after the destruction of Starkiller Base. We might even see a modern adaptation of the Hoth battle, where the First Order arrives just as the Resistance is packing up and preparing to switch bases. Remember, a few months ago there was a rumor that Laura Dern’s character would replace Leia as leader of the Resistance after being severely injured. The scene supposedly occurs “just after an evacuation”, implying a battle with the First Order that the Resistance will lose. Leia’s grave situation might also serve as segue to the galaxy’s political situation. Episode VIII director Rian Johnson helped shape the TFA prequel novel Star Wars: Bloodline, including the state of the new Republic and the two ideological factions vying for control. With Leia out of the way, the audience will see the effects of her absence, as well as the tiny cracks in the Republic’s facade. Whereas Episode 7 was a clear conflict between good and evil, Episode 8 could delve into the gray area, and how the good guys aren’t as united as they seem to be. Incidentally supporting Mr_Ghostface_Lives assertion is the fact that Carrie Fisher seems to have a lot of downtime. While Mark Hamill has been putting in 6 am call times at Pinewood Studios, Carrie found the time to launch a new advice column on The Guardian yesterday. Her column is appropriately called Advice from the Dark Side. Disney producer Kathleen Kennedy already stated the new trilogy will be about the Skywalkers. So if Rey isn’t part of the family, there’s still Ben (though redemption seems far-fetched at this point). 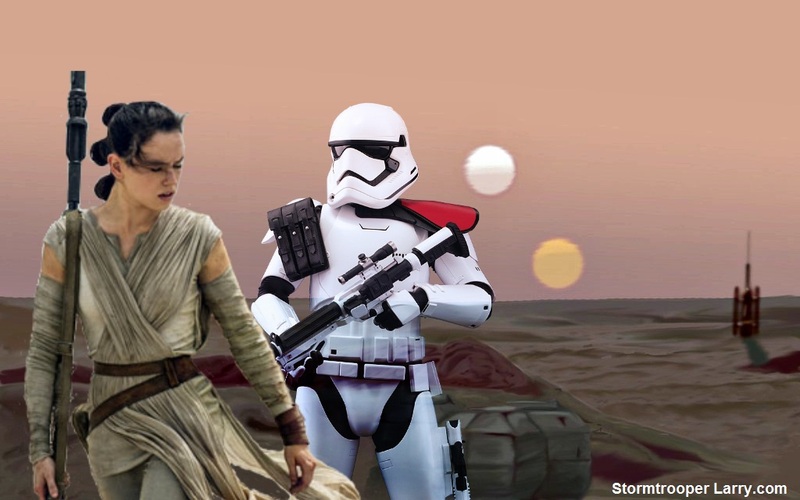 If Rey isn’t a Skywalker, where did she come from? Because of her incredible Force potential, fans are theorizing she came from an equally powerful lineage. Another theory is that she is a “child of the Force”, like Anakin. Then again, she could just be a random scavenger who was somehow on the same planet as the Millennium Falcon, Lor San Tekka, and the map to Luke Skywalker. If so, then the Force really works in mysterious ways. Stormtrooper Larry has his own theory, but we’re too lazy to get up from the couch and share it just yet. All we can say is we agree that Rey is probably NOT a Skywalker. As for the credibility of Mr_Ghostface_Lives, it’s up for debate. Some credit him to be a reliable source on TFA, while others scoff at him for his off-mark assertions like Finn being Lando’s son. Who knows, he might be the real thing, and his missed predictions might be from an early script. After all, Making Star Wars claimed that TFA’s opening scene would be Luke’s hand floating in space. Half a year later, they were vindicated after Mark Hamill confirmed that an early version of the script did open with his severed hand. Either way, you can judge for yourself by reading Mr_Ghostface_Lives’ leak history. While this will stoke debate among the Reywalkers and the Rey-nots, we can all agree on one thing: with Episode VIII more than a year away, half the fun is in speculating! Mr_Ghostface_Lives seems to have backtracked on Rey’s parentage. See the latest post here. He now claims all the information he posted is false. Last year, the biggest star of The Force Awakens was also the one without any lines — Luke Skywalker. The whole film turned out to be one big hunt for the MIA Jedi master. So what’s the latest on Mark Hamill, the face of the Star Wars saga? We gathered this week’s news so you don’t have to! In an interview yesterday with Entertainment Weekly, Mark revealed how busy he was with Star Wars Episode VIII. Asked if he had any lines in the movie this time, Mark’s tense response was “I can’t confirm or deny.” He can go toe-to-toe against the Sith, but even Luke Skywalker can’t go against his NDA. Despite Episode VIII wrapping up, Mark won’t be able to return stateside just yet. Mark has been living on London for the past year. 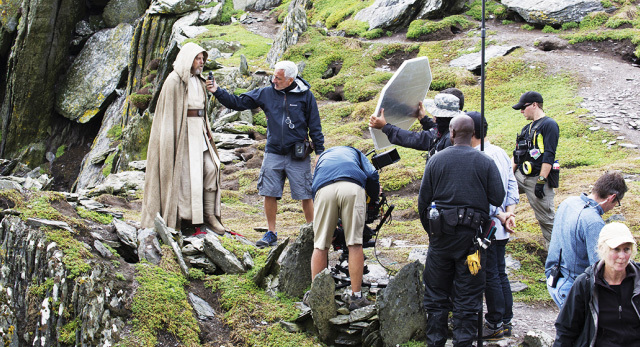 He was required to return to Skellig Michael for the first footage of Episode VIII in November, even before The Force Awakens screened in theaters. By January, principal photography for the sequel was in full swing, and Mark’s been busy ever since. While the film wraps up this month, he still won’t be able to attend the Comic-Con in July due to Star Wars Celebration. 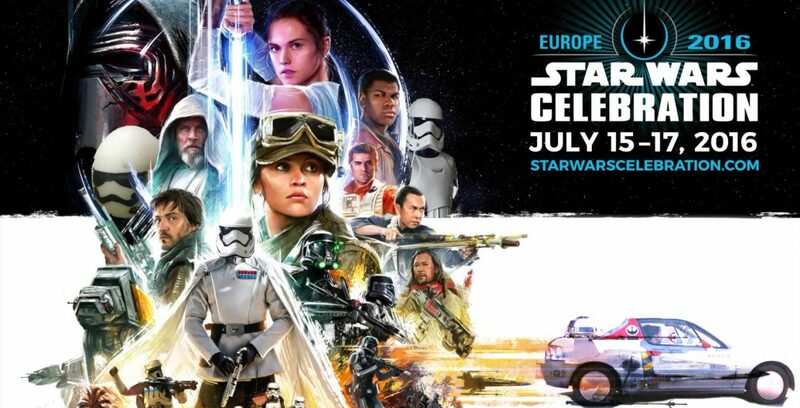 This year’s Celebration will be held in London on July 15, just one week before Comic-Con, hence the reason for not being able to commit to San Diego. After working with Episode VIII director Rian Johnson for the past year, it seems he and Mark have a chummy relationship. Rian happened to reside in St. Lukes Road, a ritzy place in Notting Hill. 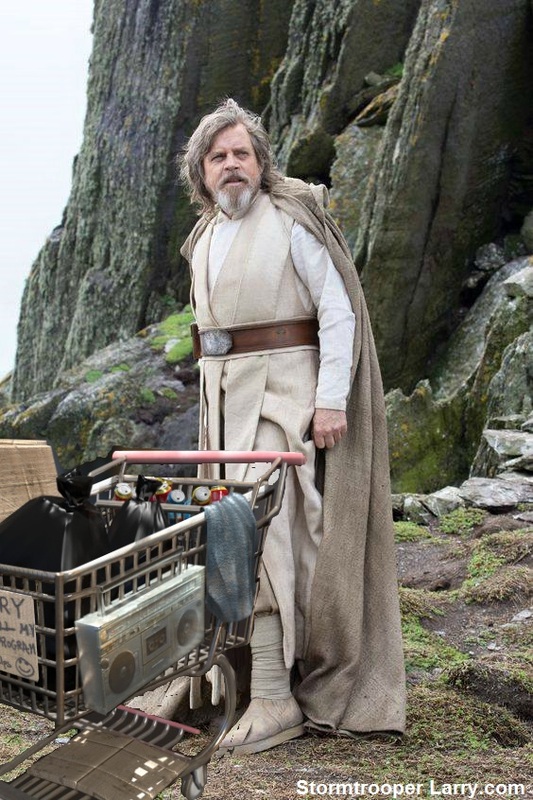 We hope to see an action-packed Mark Hamill in Episode VIII… whether washed or unwashed! 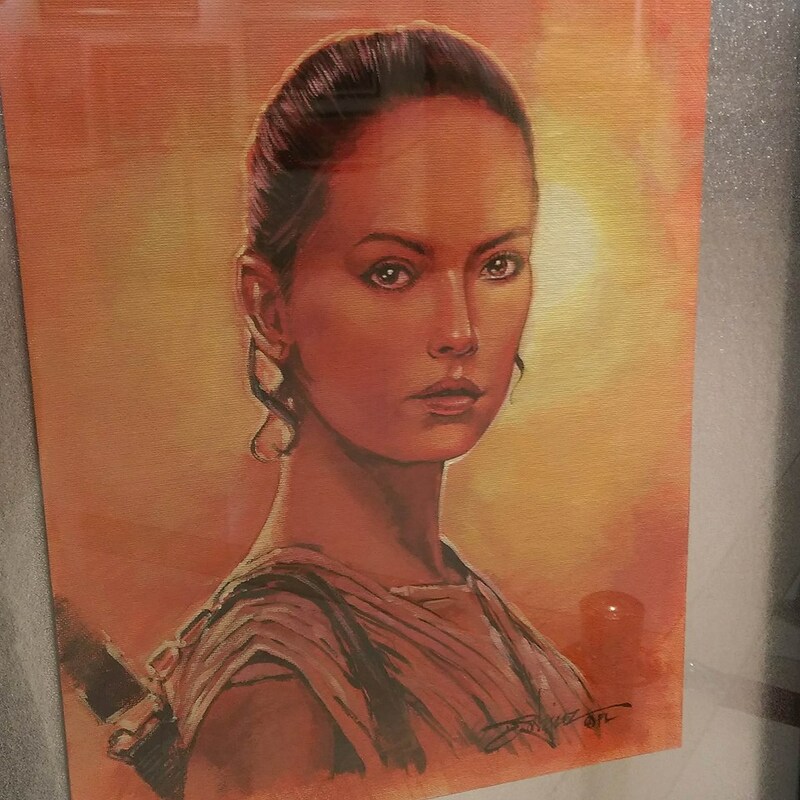 Meanwhile, check out the mysterious licensed Lucasfilm painting entitled “Rey Skywalker”! James’ belief is a familiar tune. Writer and director Rian Johnson is said to have personally chosen the location and will need the help of an extraordinarily large number of extras from Las Vegas and the surrounding area. Reports claim that a big reason in choosing to film in Nevada is that the state has recently been providing significant incentives to production companies that choose to film in their state. The production epicenter of Star Wars is currently Pinewood Studios in London. Episode VIII is now filming there, while Rogue One will start the reshoots next month. After that, the massive soundstages will be the home of young Han Solo come January. 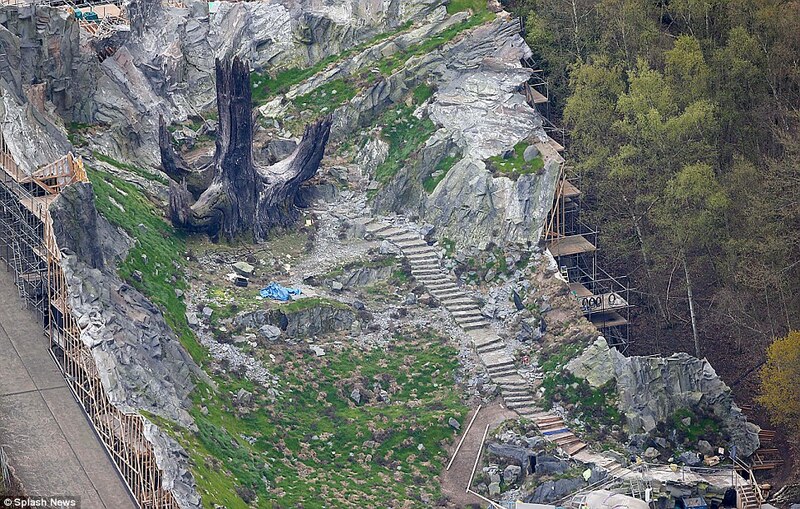 Some of the work for Episode VIII has been outsourced to Longcross Studios in Surrey, home of the life-size Falcon and Ahch-To set. The Daily Mail and other outlets mistook it for Pinewood, and the set has suffered numerous break-ins from intrepid spies and urban explorers. Also involved in Episode VIII production is Imaginarium Studios, a digital studio specializing in motion-capture scenes founded by Andy Serkis (who also plays Snoke). So no, James from Virginia, it seems like Episode VIII won’t be coming stateside. Though it would be nice if the rumored “binary sunset” scene would be shot in Death Valley, as a throwback to A New Hope! Can’t wait for Episode VIII? Check out the latest on Rogue One and its mysterious orange crates!